Description: Bold luggage labels Secure 'name check' window 'Snap-lock' design Protects personal contact information .. Description: Real leather luggage labels 2 Per pack Personal details are hidden Secure buckle fastening Luxury luggage identity .. Description: Fun check suitcase strap Quick luggage recognition Strong, hard-wearing buckle Fully adjustable to fit most cases .. Description: Colourful luggage labels Secure 'name check' window Creative, fun designs Protects personal contact information Easy to spot on a busy luggage carousel .. 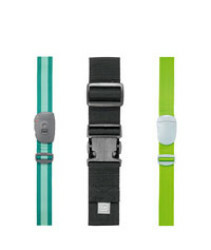 Description: Luggage strap that facilitate recognition .. Description: Glamorous real leather luggage label Secure buckle attachment Makes identifying luggage easy Made from soft leather .. Description: Fun check suitcase strap Quick luggage recognition Strong, hard-wearing buckle Fully adjustable to fit most cases 3 Dial combination lock .. Description: Bold & colourful bag tags Ideal for quick luggage identification Conceals personal details Slimline & easy to spot 2 Per pack ..